I found a link by way of Enter the Octopus to this Where I Write page from photographer Kyle Cassidy, which contains photos of writers in their workspaces. (You'll need to click that link and go there to understand most of this post.) 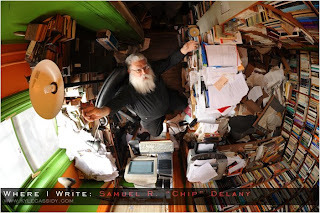 One of my favorites of the set (copied here) is of Samuel Delany in his writing space. The small room in what looks to be an old building, piled high with stuffed bookshelves and a window by the desk really appeals to me. Also I like the paint colors. The green is very similar to the wall color of my kitchen, while the orange is the same as the color in my dining room. It's bit disheveled for my comfort level, and I'd love to straighten or put away those heaps of paper, but what a nice little room. Others I like include Elizabeth Hull's room with the free-standing bookshelves, though that desk needs to be seriously tidied up. If I were to let mine get like that, I would become even more mentally unbalanced than I normally am (but J would make me clean it up long before it got that messy anyway). Swanwick and Datlow have nice rooms and, in both cases, they strike me as exactly the sort of spaces that I would picture them being in if I had never seen these pics. And check out the image of Fred Pohl. The room he is in is perhaps nothing too special, but look closely at the man himself. There's so much story in that face. It's a great photograph of a great figure of the sf genre. But, of course, different people do differently in different spaces. Personally, I think Piers Anthony's room is tragic. It looks like he just moved in (though years ago) and never really unpacked or got set up. If J went into that room, he would immediately pull down and throw into the trash those vertical blinds. "And why's all this junk on the floor!" he would say. It's a neat pic of the author, though, despite the aesthetic problems that plague the space. Similarly, Harry Harrison's space is not the most attractive. It's a bit too spare and unlived-in like Anthony's, though it's tidier. And, again, a great image of the man himself. One room that's not quite to my taste but is well done is Ben Bova's. It's not really the way I'd want a workspace to look, but it's orderly. There's a lot of stuff in it, but it's not messy. Stacks are neat. It looks like he would know completely what is in that room and where to find it. Some of you have seen little bits and pieces of my own workspace in images of me that have shown up here and there over the months. Considering how modest our home is (it's a somewhat smallish first floor of an old two-family house in one of OKC's few attractive neighborhoods), and how much I would like to move to another home in a different city someday soon, I very much like the room that I call the "library," and which would have just been a second bedroom in a more conventional family relationship. It's sunny most of the time, with a south-facing window. It has big, lovely houseplants in it (thanks, J! ), and a lot of books. When we painted the place (we did every inch of every room because the existing scheme was uber-fugly), I chose a rather intense blue wall color (because I like it and also because we had already used yellow, red, green and orange elsewhere). Later, I heard that blue is supposedly a good color for a "creative" work space. Maybe there's something to it: we were living here for five months already before we had the money to buy paint, and I did no creative work to speak of. Since then, since the advent of the blue walls, I've done a lot of personal writing and founded M-Brane.